H2OGO! : H2OGO! is your destination for summer inflatable fun! The H2OGO! Color Wave Pool makes a wonderful addition to your backyard. Your kids will have an enjoyable time in the summer with the new H2OGO! Color Wave Pool which has built-in LED lights that illuminate the pool in five different neon colors! It features a wave generator for that fun water park experience. With the included multi-colored lights, the party doesn’t need to stop at dusk. Made of quality material for long-lasting use, it is suitable for children ages 3 and above. This kids’ wave pool is an ideal way to create enduring family memories. You can find the Color Wave Pool at a number of retailers, including Amazon.com. Step2: The Step2 Company, headquartered in Streetsboro, Ohio, is the largest American manufacturer of preschool and toddler toys and the world’s largest rotational molder of plastics. Their mission is to be the leading innovator of children’s products that build imaginations and enrich the family’s celebration of childhood. As we enter into the Summer season, we thought your little one would enjoy some new water toys, like the brand new Waterfall Wall and the Finding Dory Swim & Swirl Water Table! Double the playtime fun with the Waterfall Discovery Wall, available exclusively at Toys”R”Us. Kiddos will enjoy scooping the water and watching as it cascades through the zigzags, spinners and funnels on this two-sided water wall. Scoop up water from the basin and pour it in the top bucket to start the water maze fun! Children can allow their imagination to run wild as each water maze piece can be moved to create a new design. The Waterfall Discovery Wall comes with a 13-piece accessory set and requires minimal assembly. 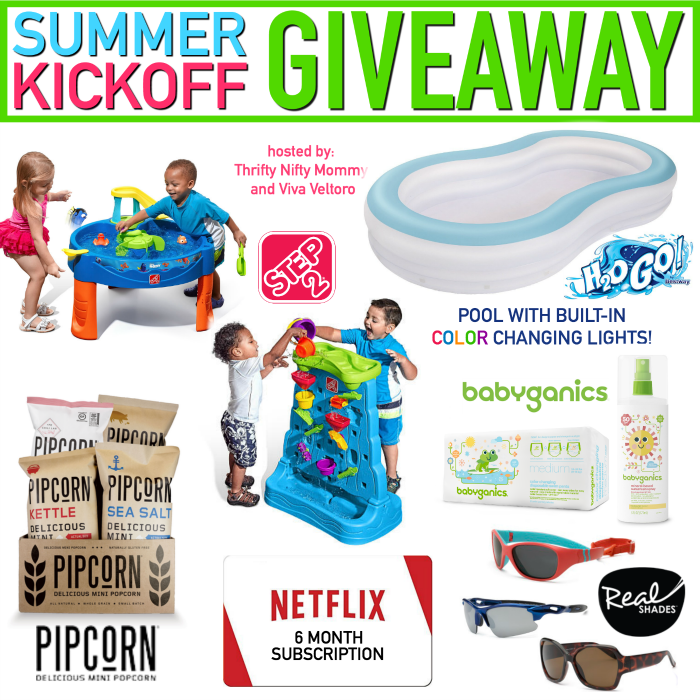 Pipcorn: If you’re a Shark Tank fanatic, you may have seen Pipcorn on Season 6. Pipcorn was founded by Jeff & Jen Martin, a dynamic brother and sister team. The Pipcorn seed was planted when Jeff was helping Jen move apartments in the spring of 2010. In desperate need of a snack, Jen remembered these special little kernels that she had gotten a few days earlier. Five minutes later, they were snacking on the best popcorn they had ever had. Two years later (and an unbelievable amount of support from family and friends), they launched Pipcorn and the rest is history! All of their delicious flavors are popped in small batches and seasoned by hand. Pipcorn is delicious mini popcorn that is all natural, gluten free, non-GMO, vegan, and whole grain! Pipcorn can be purchased directly from their website. It can also be found in select Kroger locations and will be launching in select Targets June 5th! Visit the store locator to find a location near you! The winner of this giveaway will receive the Shark Tank 4 Pack! This Shark Tank special includes one of each delicious flavor: Truffle, Sea Salt, Kettle and the new spicy flavor Chili Lab! Pipcorn is the perfect snack for road trips or summer movie nights. Netflix: What goes best with popcorn? Movies of course! After a day of fun in the sun there’s nothing better than to relax together as a family and watch a movie or binge watch your favorite series. Netflix is the world’s leading Internet television network. Over 75 million members across the world enjoy more than 125 million hours of TV shows and movies every day — including original series, documentaries and feature films. Watch as much as you want, anytime, anywhere, on just about any screen that connects to the Internet. The winner of this giveaway will receive a 6 month membership to Netflix Streaming Service. Real Shades: Launched in 2002, Real Shades has evolved into the most protective & stylish sunglasses for babies, kids, teens & adults. Whether you’re planning a road trip to the beach or just heading to the neighborhood pool, Real Shades has your family covered. The winner of this giveaway will receive 3 pairs of Real Shades! What a great way to start the summer! These are amazing prizes and I know that the winner is going to have a great time with this whole package! Good Luck everyone! Next post: Summer is coming and the living is easy with Poise! Really want to win this! I want to win this so I can gift my sisters the baby stuff and use the Netflix subscription as mine is almost done.